This seasoning and preservative is there at least as long as Wine, Because this is, if you do not prevent it, ultimately always to vinegar. 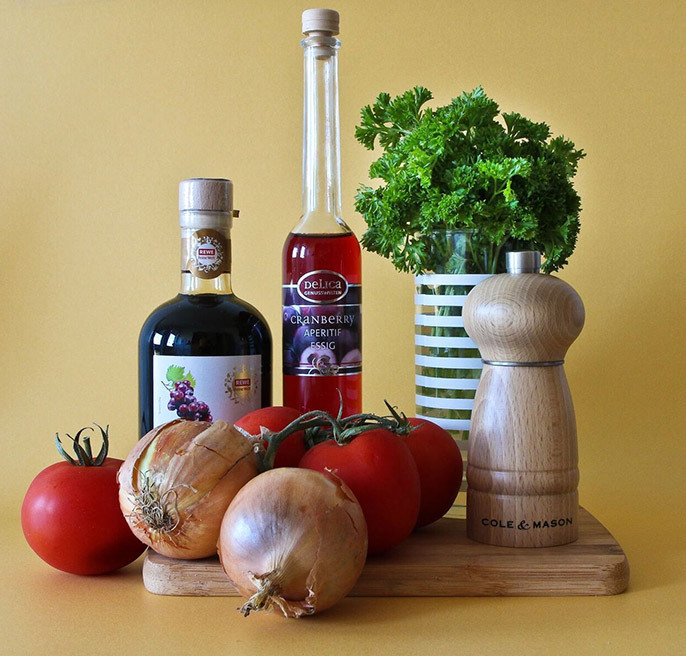 Vinegar has been in the antiquity used as a beverage mixed with other ingredients. A medical application for respiratory diseases and indigestion is already through Hippocrates (460-377 BC). The Roman author Columella (1st cent.) Reports in his work "De re rustica" on the vinegar production of figs, barley and wine. Vinegar has played a role in many cultures. In the Bible Vinegar is mentioned as a staple food, in the Egyptians there was "hequa" (vinegar drink from barley beer), in the Babylonians Vinegar water was a refreshment drink that Phoenicians turned off cider their sour Shekar, the Greeks used it at sacrificial ceremonies, the Roman legionaries protected themselves with the Posca (Vinegar water) from colds and in Japan you know the traditional Tamago-Su (rice vinegar), in which a raw egg is dissolved. In the Middle Ages herb vinegar was considered a remedy, report on it Hildegard von Bingen (1098-1179) and Nostradamus. Of the Pestessig was used against this disease.